North Korea and South Korea have reopened the Kaesong Industrial Park, which had been closed for about 5 months. In April, North Korea shut the factories down because it was upset with South Korea. 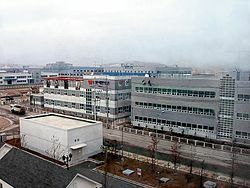 In 2003, the two countries started the Kaesong Industrial Park factory project in North Korea near the South Korean border. South Koreans built over a hundred factories and employed about 50,000 North Koreans to work there. North Koreans took home the paychecks and South Koreans took home the goods. North and South Korea were part of a single country called Korea for over four thousand years until 1948. A line in the middle was drawn and two countries, North and South Korea, were created. The two countries have not been on good terms, and keep having tiffs.